SWAPPING fast cars for fast bikes, Formula One star Fernando Alonso took to the saddle among the world’s fastest men on two wheels. Attending a MotoGP team Honda post-season celebration, Alonso put his F1 woes behind him after a disastrous 2015 with McLaren-Honda. 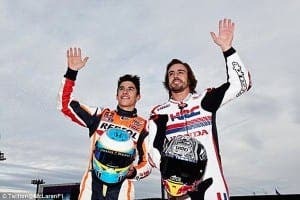 Riding alongside fellow Spaniard and MotoGP’s young starlet Marc Marquez, Alonso completed several laps at the Motegi circuit in Japan. But it wasn’t all bikes for Alonso, who also gave Ayrton Senna’s 1991 championship-winning F1 car a spin.